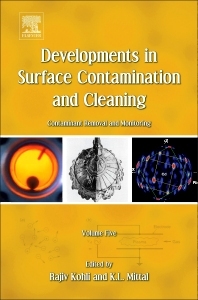 In this series, Rajiv Kohli and Kash Mittal have brought together the work of experts from different industry sectors and backgrounds to provide a state-of-the-art survey and best-practice guidance for scientists and engineers engaged in surface cleaning or dealing with the consequences of surface contamination. This volume complements Volumes 3 and 4 of this series, which focused largely on particulate contaminants. The expert contributions in this volume cover methods for removal of non-particulate contaminants, such as metallic and non-metallic thin films, hydrocarbons, toxic and hazardous chemicals, and microbiological substances, as well as contamination monitoring in pharmaceutical manufacturing, and an innovative method for characterization at the nanoscale.